This group combines traditional West African songs, rhythms, arrangements, and at times dance, with other musical and theatrical ideas to provide energetic and eclectic performances. 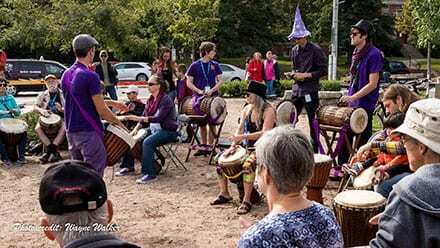 Booming with the sound of djembes, dununs, horns, bells, shakers, and voice, the ensemble will lead the Drum Circle at our Festival Tent on Saturday morning and again be part of our Fresh Beats Rhythm Parade. Let Djugdjug help you find your “beet” and be part of the excitement and fun that is the pulse of the Deep Roots!